Introduction The simulation of diameter distributions is the basis for predicting volume in the so-called diameter distribution models. Combined with volume, volume ratio and taper equations, these models allow the prediction of volume assortments according to user needs. The simulation of diameter distributions is also essential in initialising individual tree models. It is also a useful aid for planning harvesting operations. Methods In this paper, Johnson’s distribution was used to model the diameter distribution of Eucalyptus globulus in Portugal. When a predefined probability density function is used as part of a growth and yield model, the parameters of the function must be estimated for each year during the simulation period. Results The development of a system of equations that relates stand characteristics to mathematical functions of the distribution, such as the moments of the distribution, allows for the estimation of parameters (i.e. parameter recovery). This method assures compatibility between the characteristics of the observed population used in parameter recovery and those obtained through simulation. Conclusions The system of equations was built in such a way that the observed well-established biological processes between stand variables is maintained, and the equations were simultaneously fitted to minimise the determinant of the covariance matrix of errors. Based on validation with an independent data set, the model provides precise estimates of total stand volume. This work was supported by the FP6 EFORWOOD IP project (contract 518128) and the FCT project CarbWoodCork (POCI/AGR/57279/2004). 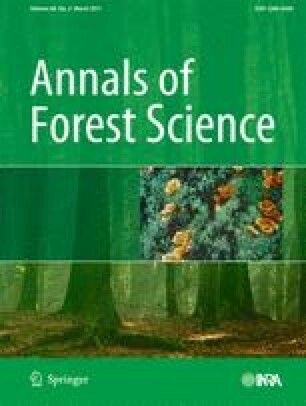 The authors gratefully acknowledge Bernard Parresol (USDA Forest Service Southern Research Station) for facilitating the use of a SAS program for the Johnson’s S B distribution parameter recovery that was used in an initial stage of this research. The authors also thank the pulp companies Celbi and Silvicaima for providing a large portion of the data used in this study.